(Long Island, N.Y.) Stay-at-home mom Naomi Yochai of North Woodmere loves to fly. But not in a plane. 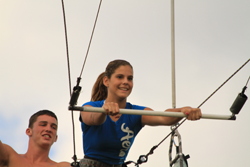 Naomi flies through the air on a flying trapeze, and so do her three kids ages 14, 11 and 6. Naomi and her clan do their flying at I.Fly Trapeze School at both of their locations in Long Beach and Eisenhower Park. 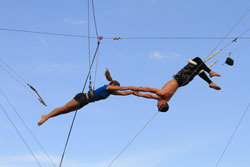 Naomi first experienced the trapeze while on vacation at Club Med in Mexico. She thought it looked like a fun challenge. After the first time she was hooked. And he assures that flying the trapeze is perfectly safe. It’s not a sport that you need any experience for and believe it or not, it does not require upper body strength. The school takes kids as young as 4 and their oldest flier, Joe Malcomson of Lynbrook was 89 the last time he flew. He made it into the Guinness Book of World Records for being the oldest man on the flying trapeze. Naomi’s six year old daughter Jayden first went up last summer and now is obsessed with flying, Naomi said. She’s in all the school’s performances. Her favorite trick is the Birds Nest where she swings out hanging from her hands then lifts her feet and arches through so that her feet and hands are touching the bar. 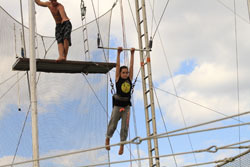 Like Mom, Naomi’s son Jonah, 11, and 14 year old daughter, Jodanna first tried the trapeze at Club Med. They both have been flying with I.Fly for about a year, attending classes once a week. Jordanna’s favorite move is the Gazelle. 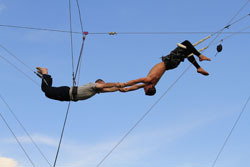 All of the instructors have circus and trapeze backgrounds, Rosamilia said. Some have been trained directly by the brothers. For more information go to Iflytrapeze.com.